A Pultec-style EQ is always good to have in your bag of mixing tricks, and this one is all that and more. Great sounding Pultec-style EQ with more flexible settings than most. Switchable cut/boost for mid/high filters, optional adjustable Valve mode, Attentuation Shift for focusing bass, added high-pass filter. No mid/side mode, control layout not immediately intuitive. NobleQ is PSP AudioWare's ninth EQ plug-in, and it's in stark contrast to the linear-phase Neon 2 we reviewed earlier this month, being akin to the analogue-inspired EQs in their excellent sQuad pack. 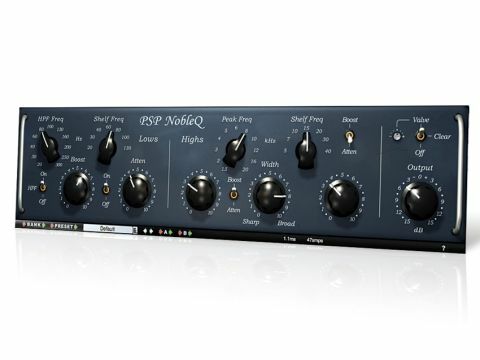 It takes its cues from the classic Pultec EQP-1A equaliser, and in fact, there are two plug-ins in the package: NobleQ and NobleQex. Both are in VST, AU and RTAS formats. "We can say with certainty that NobleQ easily stands up to the best Pultec plug-ins out there." Let's take a tour of NobleQ first, which is most similar to a real Pultec. First, there's a high-pass filter (up to 300Hz), which you won't find on a real Pultec, though it has the right vibe with its gentle slope. Considering the importance of high-pass filtering in mixing, it's a wise inclusion. The remaining EQ controls do everything a real Pultec does and more. There are two low shelves, one for boost and one for cut. They're at offset frequencies, so cranking them both gives an ear-pleasing 'bass bump'. Up top, there's a bell/peak filter and a high shelf, unlike a real Pultec, where the bell boosts and the shelf cuts, each can boost or cut. The frequency selectors have greater ranges, too, and can also be set to positions between the 'notched' ones. There's a Valve option on the output, with a tiny knob for adjusting the saturation threshold. By default, it's a little hotter than we'd like for everyday use, but it's easily dialled back (you can turn it up too, for obvious drive). The gentle saturation can be most useful for taming aggressive transients, such as those caused by treble boosting. As well as imparting analogue-style warmth, the Valve mode also subtly damps the upper treble. The Clean mode disables the valve simulation altogether. NobleQex has an additional midrange bell EQ that's focused on the 150-5000Hz range, nicely complementing the existing treble-focused bell. There's also an Attenuation Shift control for setting the frequency offset of the bass shelves. In use, typical Pultec-style equalisation is easily had. As much as we love Pultec EQs, though, their limited nature means we often use them as an 'enhancer' in conjunction with a more conventional EQ. PSP have thought about this, as their additions make NobleQex viable as a channel EQ for general signal-shaping, like a console-style EQ. Still, the filters are broad, musical and decidedly non-surgical - for instance, the low shelves can have effects as far up as 1kHz - so you will sometimes need to bust out an additional digital EQ for precise tweaks. The low end section can add serious thump to any signal - great for bass and drums - but reducing the Attenuation Shift focuses this effect further, while cranking it gives looser, broader enhancement. It's a great addition, as you can get the low-end clout just right. The midrange and treble sections give very smooth results, and we found these filters useful for highlighting elements in mixed signals, such as when mastering. And shining up the top end with the treble bell boost is an aural pleasure. We compared NobleQ to a few of the most revered Pultec EQ plug-ins, namely Softube PE 1C, Universal Audio's Pultec EQP-1A and IK Multimedia's Vintage Tube Program Equalizer. We first had a go at recreating the same EQ sound with all four plug-ins, and while this is far from a scientific or definitive test, it gave us insight into the differing calibration of controls across the plug-ins. As for sound, broadly speaking, we found the UA effort a little 'flat' compared to the others, also noting that it doesn't model harmonic distortion at all. The IK just edges it as our favourite for treble bell boosting, but only with its Oversampling option engaged. We also preferred the low end on the PSP and IK efforts to the others. Overall, the differences aren't dramatic, but we can say with certainty that NobleQ easily stands up to the best Pultec plug-ins out there. And when you factor in its far greater flexibility, it's arguably the most appealing of the lot. In all, NobleQ sounds as good as you'd expect from PSP. We almost always skipped NobleQ, though, in favour of NobleQex, since we couldn't think of a reason not to have its full array of features to hand, which make it suitable for mixing and mastering any type of material. If you're in the market for an analogue-style EQ, you should check this one out even if you've already got a Pultec-alike, since this one goes beyond the limited vintage design.